Two Days Left of the Summer Mini and DSP Sale! It seems like summer is just getting started but after looking at the calendar apparently September is almost here! So, while I guess that is cool because that means back to school, fun fall events are coming soon, and the new Holiday Mini is about to be released. But…. That also means that there are only 2 more days to get your favorites from the summer mini or to take advantage of the buy 3 get 1 free promotion! Click either picture below to get more details. 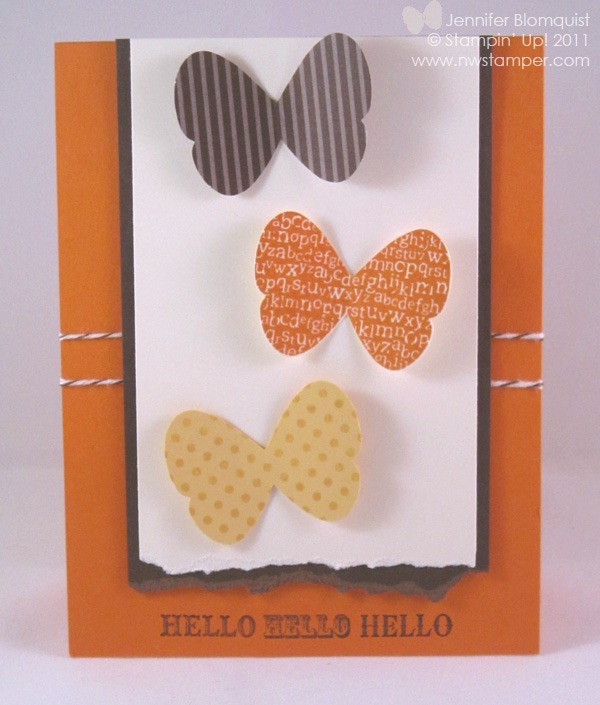 I also thought I’d share a card I made using one of my favorite sets from the Summer Mini – Happy Greetings and the super fun bakers twine. 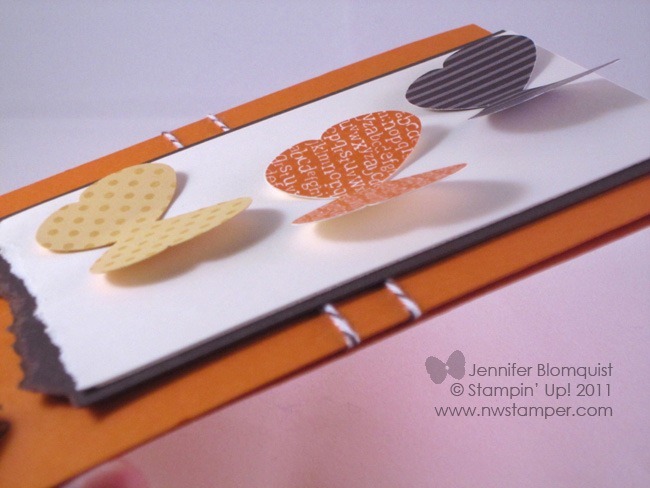 You may remember that I had made this same card using the Strength and Hope stamp set back in July but I was wanted to use up some of the extra supplies I had from that card and so I changed it up to use the butterfly punch, some designer paper, and stamps. I also adhered the butterflies using glue dots only in the center of the butterflies so that I could bend the wings out to make them look like they were flying off the page. I’m back from my trip to California and I’m happy to share that my nephew’s surgery went well and while he has a lot of recovery ahead of him, he is doing great! It really is amazing to me how advanced medicine has become these days and how much people go through on the road to a cure. For example, my nephew was born with a heart condition that would have probably been fatal 20+ years ago but now you would never know he has now had heart surgery twice in his 3 years of life! Its a lot of work for doctors, nurses, patients, and families; but all that work can lead to miraculous results. So, with all this in mind, I thought I’d share with you a card that I received at convention that I thought was beautiful. 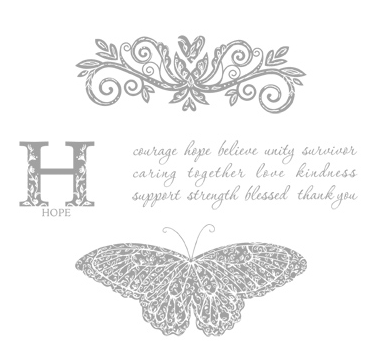 It uses the Strength and Hope stamp set from the Summer Mini – the one Stampin’ Up! is donating $2 for each set sold to the Breast Cancer Research Foundation. I love the use of the ribbon over the stamped image and then the mixed of the Perfect Polka Dots embossing folder with the Tulip Frame embossing folder. Sadly, this card did not have the creators name on the back, so if you know who created it…let me know and I’ll give them credit! Well, my adventures in California are coming to a close and I’m about to get back on the road to head back to Washington. 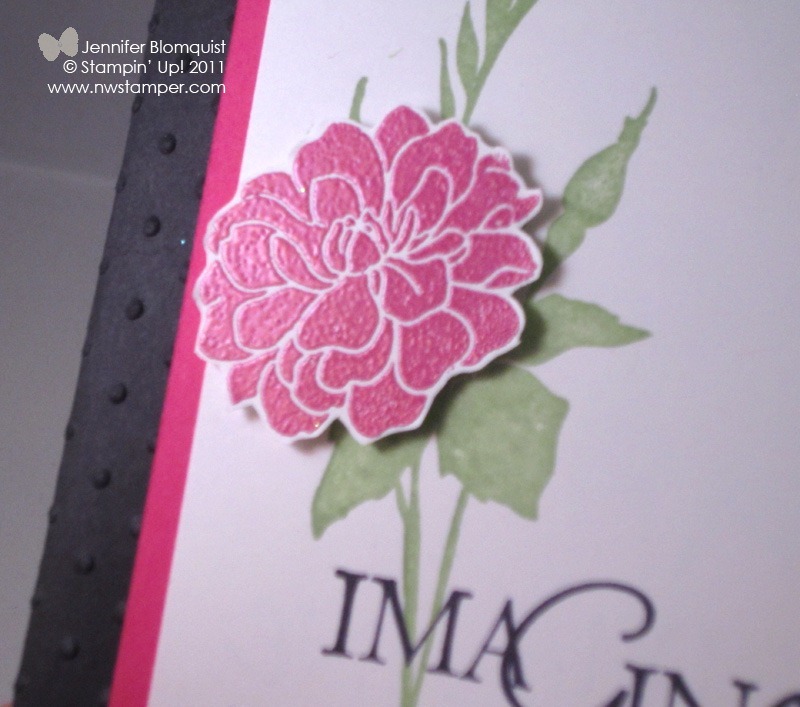 Its been a great chance to visit with friends, family, and my Stampin’ pals. Thankfully, my nephew’s surgery went great and he seems to be recovering well (enough so that he was discharged on Monday after having a major 5 hr surgery on Thursday!) So, its been a great trip. Plus, while I was down here, I had a chance to participate in a class held by my downline, Bethani Semple Let me tell you, her cards were great! I’m so glad I had a chance to do them and try out some new stuff! I’m still working on uploading the photos I took of the cards I made (I’ll share my faves on facebook when I’m done), but I wanted to share her swap from this years convention.. I love all the details in her card – from the inking of the embossed image on the Night of Navy piece – to the sponging and collaged images and rhinestone in the center. Just goes to show that you don’t have to go over the top but just the right little details make a huge impact! When I saw the Button Buddies stamp set when the new catalog came out, I thought it was a pretty cute set; but then I realized it was perfect for helping me use my “collection” of buttons in lots of fun and cute ways! So, this is one of the first cards I made with it. 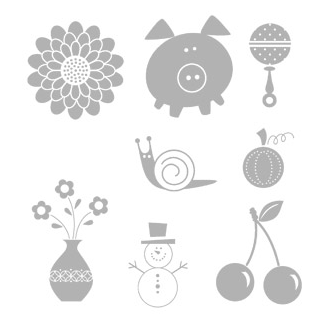 So, in each image, there is a circle or a flower that is *exactly* the right size to be covered by one of the Stampin’ Up! designer buttons. So, you can have a cute pink pig’s nose or a button belly for your snowman. I’m personally partial to the flower shaped buttons and thus my card. If you want to play with this at home, I kept it really simple and just colored the vase with a Soft Suede marker and colored the flower heads and stems with the Old Olive marker – because you want to color the flower heads so you know where to put the buttons but it doesn’t matter what color they are since they will be covered up! Also, my favorite adhesive to use when adhering buttons like this is glue dots, so one in the center of each button was perfect. I’m loving this set; what do you think of it? I had a hard time photographing this card so you could see all the cool details. 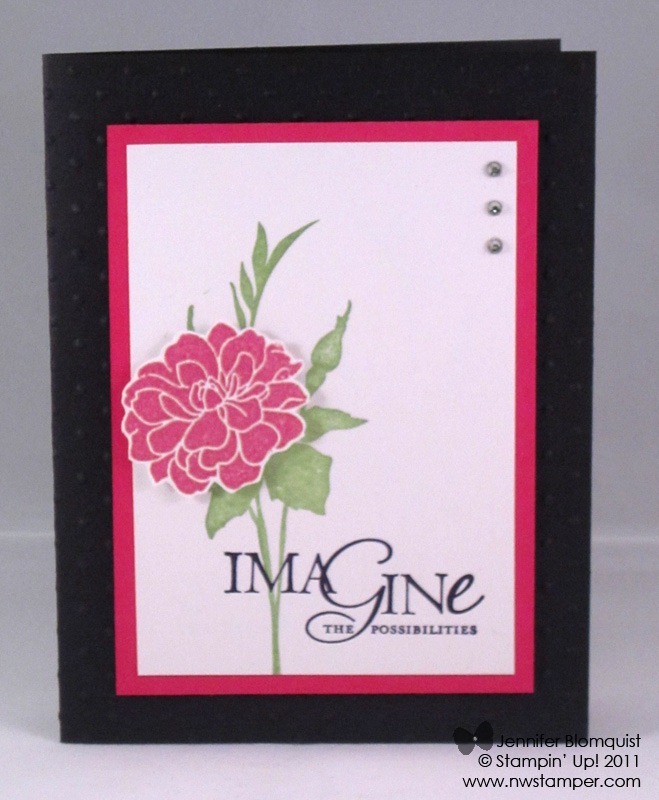 Specifically the Polka Dot embossed black cardstock for the front of the card. I also had to take a second picture so I could show you the embossed flower head. 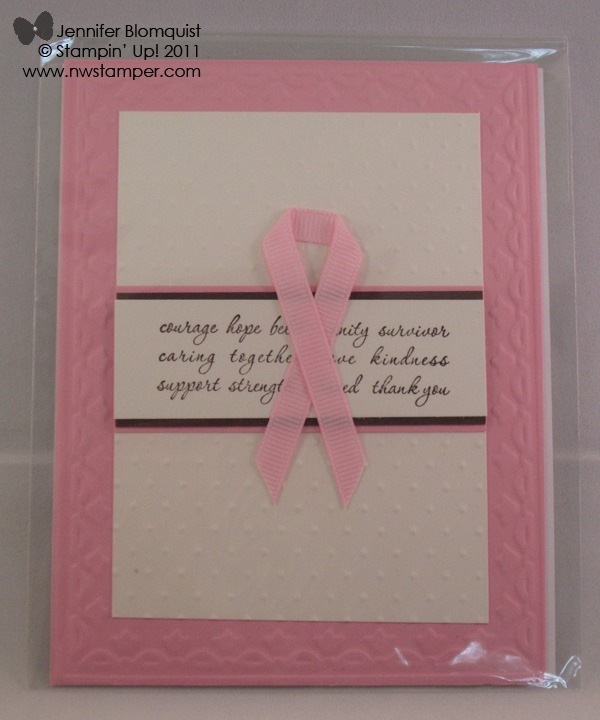 We stamped with Versamark ink and then embossed using the new Melon Mambo embossing powder. 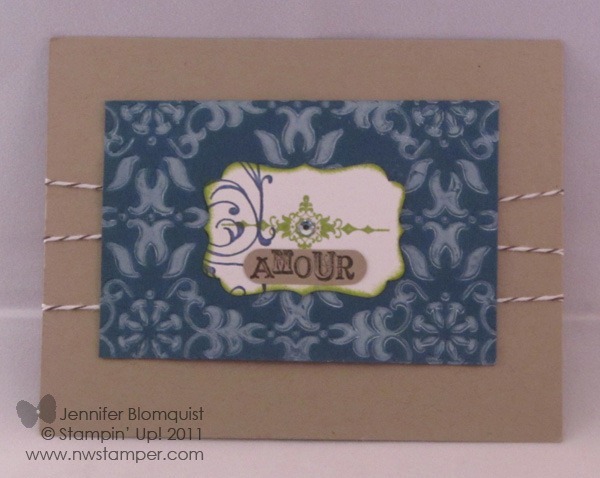 I had forgotten how much fun it was to emboss with bright colors! It makes the flower have a little bit of shine and really stand out. Then we cut it out and popped it up on dimensionals. 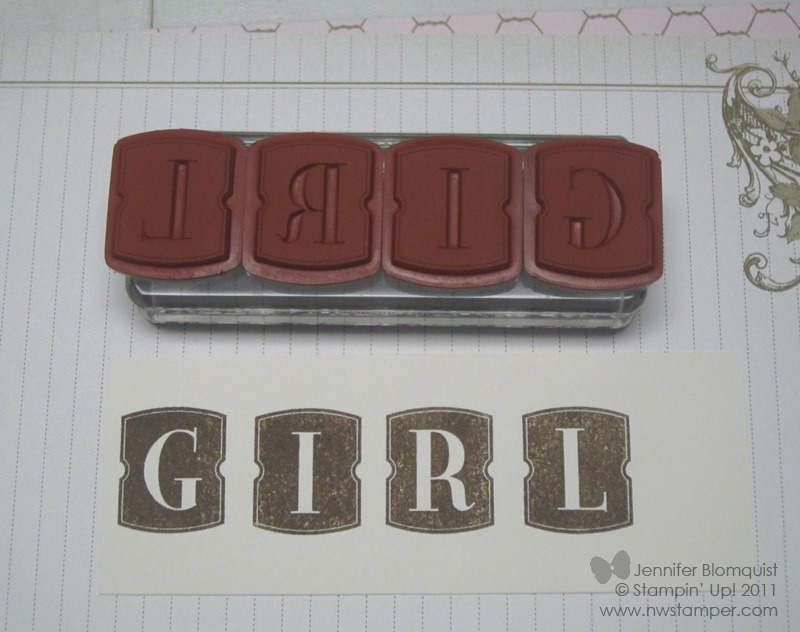 The sentiment comes from the Word Play stamp set. It seems like the perfect fit for this card, don’t you think? I recently asked folks who visit my Facebook page if they had any requests for types of projects they would like to see, and one request was for a baby girl shower invitation. 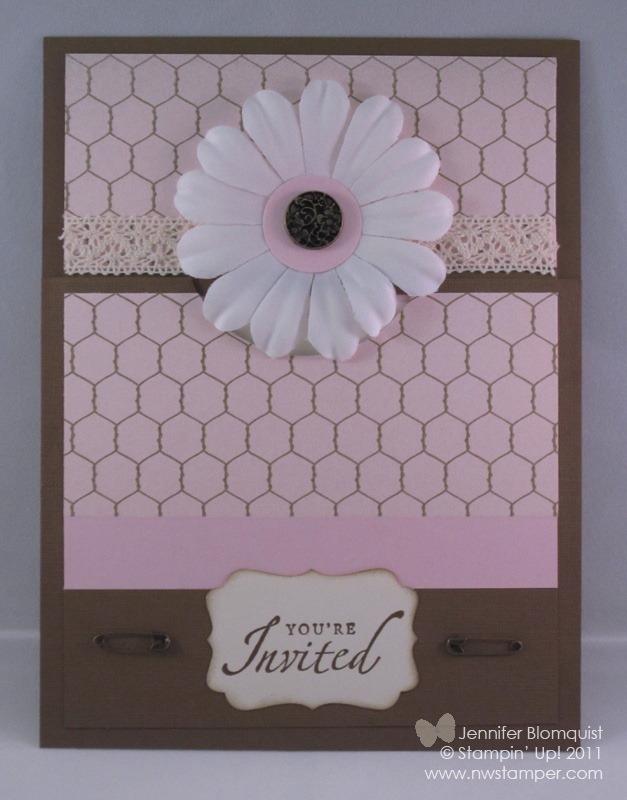 Well, after creating my baby girl scrapbook page, I was inspired to try out a matching design for a shower invitation. So, I used more paper from Beau Chateau, Vintage trinkets, Antique Brads, and Lace ribbon. But this isn’t your standard fold card. I wanted to make it a fun sleeve to hold the details of the party. Yes, I know the inside is blank so this really could be a design for a number of parties – but i figured you’d get the ideal and I’ll probably convert this to be integrated in another scrapbook page for my baby book. :) Oh, and if you are curious, the finished size of the inner card is 5” x 7” so you have enough room to add all your party details and the complete card should fit in your standard envelope for 5×7 cards. 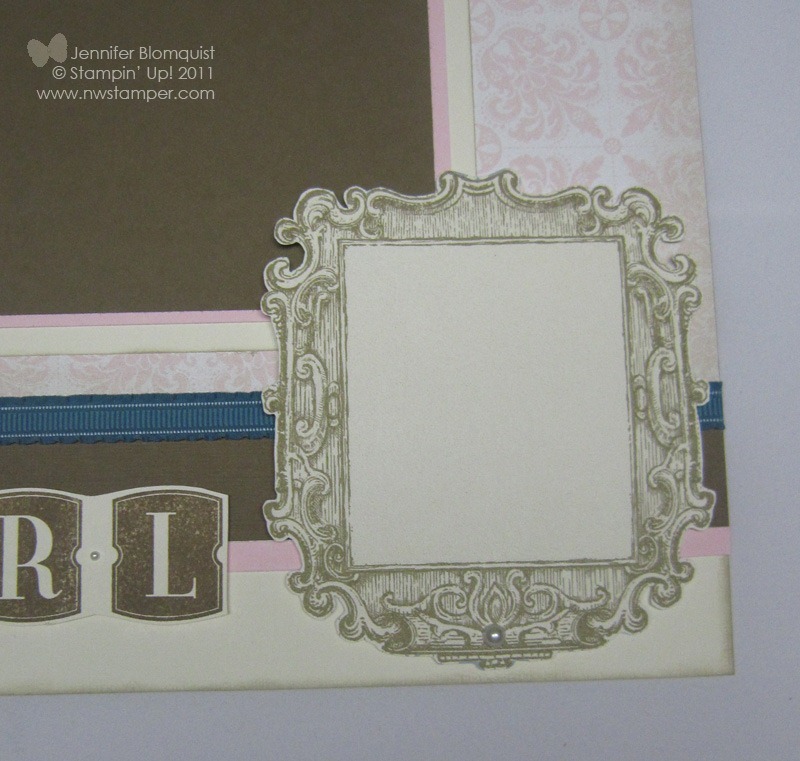 I had seen this layout on the ScrapbookSteals blog and I thought it would be perfect. The only problem was that I liked the bracket shape at the top of the page but I didn’t have anything I could trace to make that design. 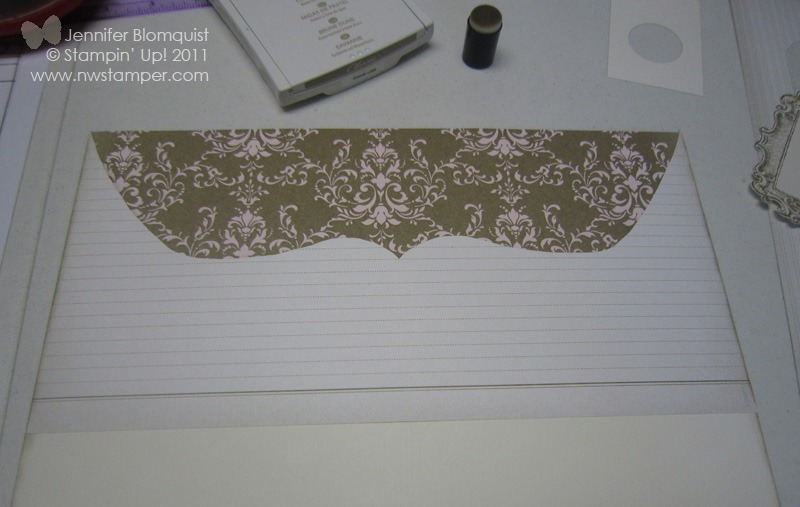 But boy did I luck out since the back of the patterned paper was lined! 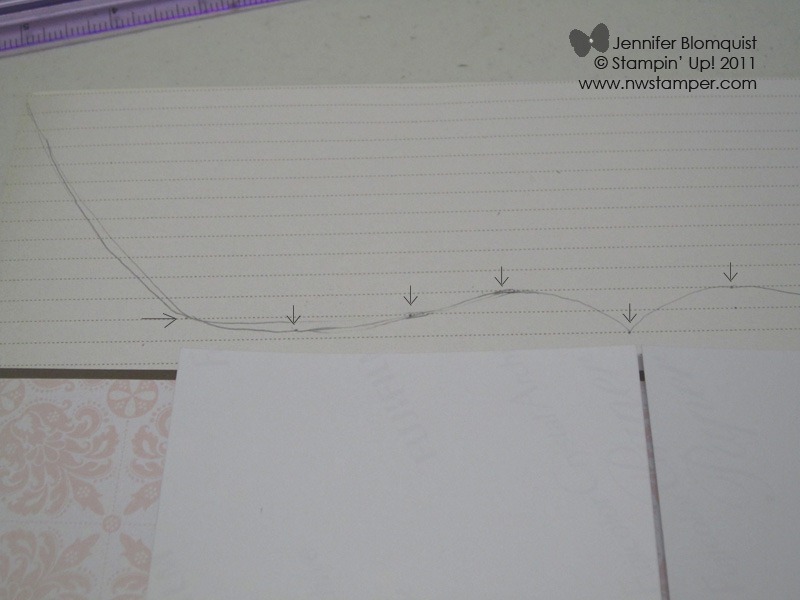 I laid out where I wanted my photo(s) to be and then drew a rough outline and used my ruler to space out where I wanted the curves to go. I also noticed that one of the other paper designs in the Beau Chateau had a pattern that included this bigger frame. 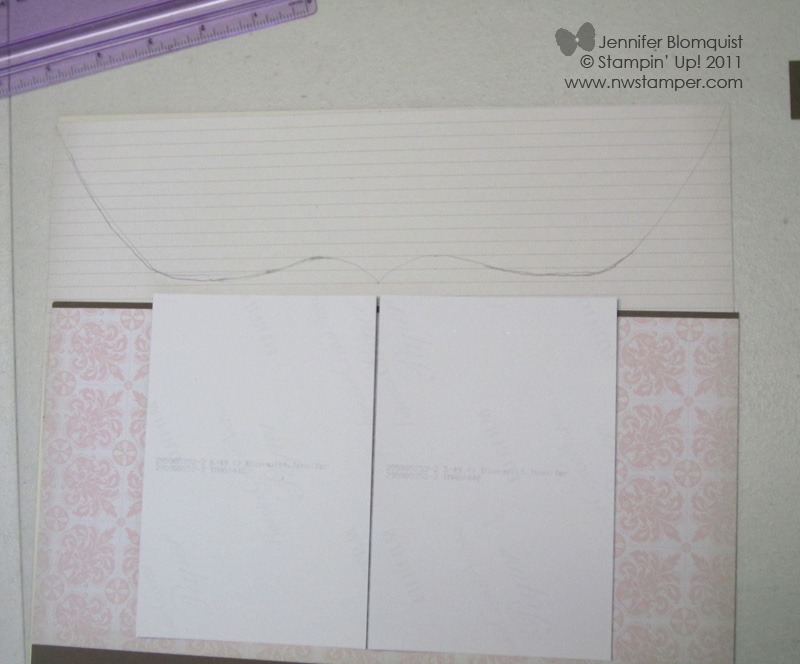 I thought it would be perfect to cut out and use as a journaling space. Finally, I had to show you my title – which was when it really hit me that we are having a baby girl! I used the Letter It alphabet, since it seemed to ft the feel of this page. This was my easy method for using them but I like the effect. I put all the letters together for a given word (I don’t have the biggest rectangle block so I had to squish them together on a smaller block) on one block and stamped them together. Then I just trimmed around the letters for a quickie title. Easy and Fun! Alright, I know this post is getting long, so thanks for sticking with me. This is my first detailed scrapbook in a while and I love how it turned out; especially with paper I didn’t think I would even like! :) Tomorrow I’ll share a baby shower invite I created to match this page (based on a request from one of my facebook fans). Hope you’ll come back and check it out!